Unite your world - bringing together offline & digital; martech & adtech supported by a single view of the customer. Deliver seamless customer experiences - with smarter, more relevant, more consistent engagement across channels and devices. Understand your audiences better - with closed-loop analytics fed by every interaction, everywhere. Perform better everywhere - maximizing your data leverage for increased acquisition, conversion and lifetime value. Control your own destiny - uniting your chosen best-of-breed partners and tools around data that you control. 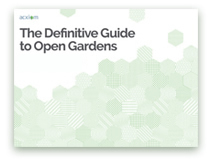 The bottom line: Open Garden helps improve your Reach, Revenue and ROI! Fill out the form to contact us today to learn even more.